Wer ist Klaus von Klitzing? Möchten Sie Mitglied bei uns werden? Sie haben die Möglichkeit, unsere Online-Beitrittserklärung zu nutzen. Selbstverständlich können Sie uns auch per Telefax oder Post Ihre Beitrittserklärung zusenden. The digitisation of science enables the analysis and simulation of complex processes using computers based on structural models. For the first time in its almost 200-year history, GDNÄ comes to Saarland, which is ideally suited as a state of information technology for this topic of our 130th meeting. The Internet and the first wave of digitization had revolutionized access to scientific results. In the meantime, computer science has developed methods for all sciences to automatically evaluate digital mass data. However, the second wave of digitisation triggered by this also fundamentally changes the way scientists work and thus holds enormous potential for breakthroughs in science, medicine and technology. 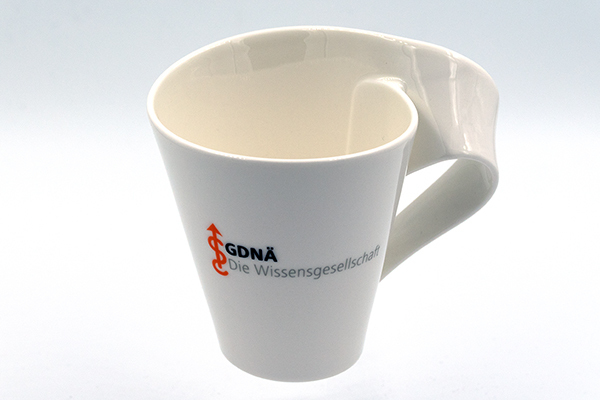 As a small gift and thanks for their commitment, the speakers, volunteers and donors will receive a cup decorated with the GDNÄ logo. The cup from the NewWave series with the characteristic wave shape made of the finest premium porcelain in pure white from the world brand Villeroy and Boch (est. 1748) serves as a souvenir from Saarland. The NewWave collection, which was awarded the „Innovation Prize of German Industry“ and the „Trend Tableware of the Year“, impresses with its asymmetrical shape and curved lines. For the first time, a regional meeting of the GDNÄ took place in the Rhine-Ruhr region between Koblenz and Dortmund on 8 May at the invitation of the Secretary-General. About 400 GDNÄ members live there. 35 people took part in the meeting at the Deutsches Museum in Bonn, not only members, because the program in the vicinity of the Lego exhibition had also attracted some accompanying persons and guests. Most of the participants came from the immediate vicinity, but Dortmund and Wuppertal were not too far away either. All age groups were represented, from young to old. At the invitation of GDNÄ President Prof. Wolfgang Wahlster, the second regional meeting for the Saarland and West Palatinate region was held on February 21st. 15 dedicated GDNÄ members met at the German Research Center for Artificial Intelligence (DFKI) in the late afternoon. Prof. Wahlster gave a lecture on „Machine Learning – Application Success and Open Problems“, which was discussed intensively especially with regard to the implications for applications in the field of medical assistance systems and autonomous driving.